Welsh terriers are rectangular shaped dogs with harsh wiry coats. Their sweet faces are characterized by bushy eyebrows, beards and moustaches. The Welsh terrier has a squared off muzzle and v-shaped ears. 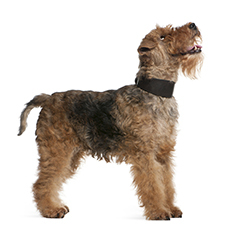 The Welsh Terrier originated in Britain. Welsh Terriers are up to 15 inches (39 cm) high. Welsh Terriers weigh 20 to 21 pounds (9 to 9½kg). Welsh Terriers come in black and tan and grizzle. Puppies are born all black and eventually the black lightens into tan. 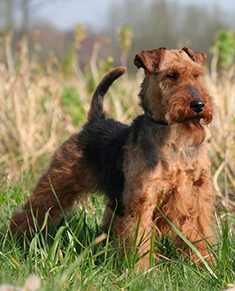 The Welsh Terrier's thick wiry coat needs to be hand stripped twice a year. This curious and playful dog is also intelligent and affectionate. Welsh Terriers are patient and do well with children. They enjoy swimming, playing and digging. Happy and spunky, Welsh Terriers do best with a young active family whose activities match its level of activeness. Welsh Terriers are prone to skin and eye problems. The expected life span of the Welsh Terrier is about 10-12 years. Welsh Terriers have almost boundless energy and should be let off a leash in an open area only if very well trained. Welsh Terriers are part of the Terrier Group. Find Welsh Terrier Puppies with our Free Breeder search!